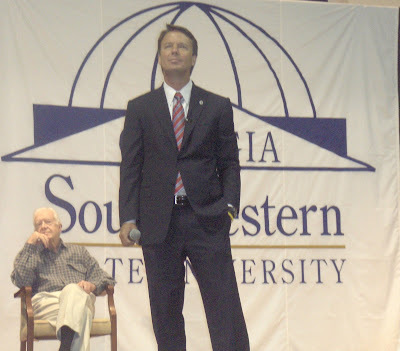 Today, more than 2,000 people turned out in Americus, Georgia to hear President Jimmy Carter introduce presidential hopeful, John Edwards. It was a day about synchronicity and connections. I sat with Macon City Councilman Rick Hutto, who served in the Carter Administration. Chuck and Melanie Byrd were there, returning to their alma mater, where they met. The Byrds and I were in Iowa together just ten days ago volunteering for the Edwards campaign, and today we heard stories from Betty Pope about her days as part of the Peanut Brigade. As Elizabeth would say, knots-connections. Elizabeth Edwards and Rosalyn Carter sat on the front row during the program, occasionally leaning in to comment quietly to each other. After all, they were the only people in the room who knew what it is like to have a spouse run for President. And, on the stage, Carter and Edwards shared more in common than simply having run for President. Both are southern gentlemen, both were raised Southern Baptist, and thirty years apart both know what it's like to be underdogs in a populist quest for the White House. Today, when Edwards called on Americans to sacrifice to address our dependence on fossil fuels, I heard the echo of Carter's voice asking Americans to conserve when the gas lines were long. The right thing is not always the easy thing. The right thing is often unpopular, frequently politically incorrect-even offensive to some, but it's still the right thing. Today, in Americus, it was as if the baton was passed, not just from Carter to Edwards, but from the generation that helped propel one Southerner to the White House to a new generation working for that same goal. "The right thing is not always the easy thing." Pretty much sums up the Carter presidency. Ronald Reagan proved that a lot of people only want to hear what they want to hear. But Carter has been vindicated on a thing or two. I read where Jack Carter has endorsed Biden. But Chip Carter is working with the Edwards campaign. Glad so many people turned out to see him. As long as he keeps himself in the top 2 or 3, I still think when it comes down to it, Edwards will win Georgia. You get to write the Georgia Improper "All things connected" column next Fall. But please leave the batons at home. Sorry to have been do long getting back here! If Chip is working on Edwards, that's good news for us. Tina made it there in fine form with camera in hand. And, batons come in handy, Vic!